I have often mentioned in my posts about the acidic fruits of our region. You certainly don’t want to bake with most of them. 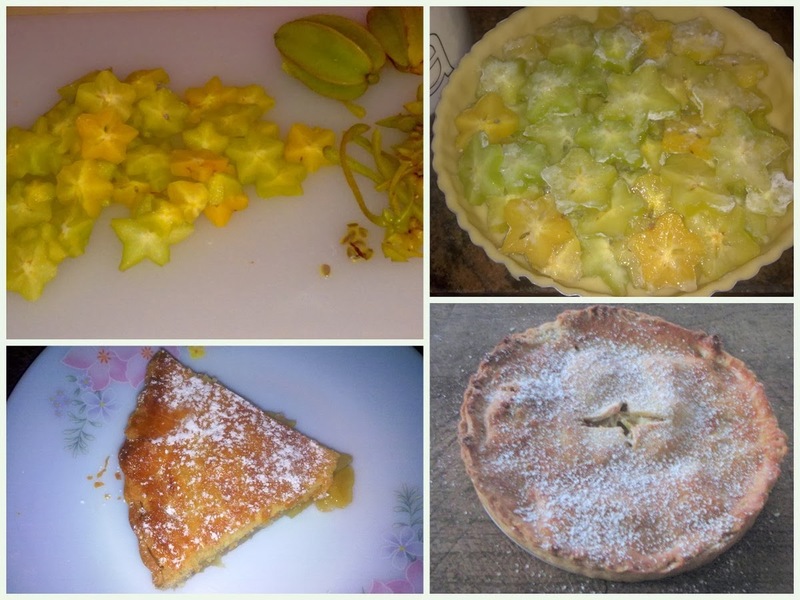 The other day as I was picking my star fruits from my potted plant, it dawned on me that I could use it in a pie or a tart rather than only pickles and chutneys. It helped that these fruits are sweet or else the idea wouldn’t have come in the first place. I have never tried or tasted star fruit in a baked dish before and I simply couldn’t wait to get on with my pastry dough. Grate the butter over the bowl of flour. Mix using your finger tips till the mixture resembles breadcrumbs. Break an egg into it and knead gently. Sprinkle the fruit juice and let the dough come together. Divide into two portions, flatten and chill in the fridge wrapped in clingfilm for at least thirty minutes. Wash the star fruits and pat dry with a kitchen towel. Cut the ends and the hard ridges. Slice into even pieces. Remove the seeds from the “stars”. Mix about two tablespoons of sugar and leave aside as you roll out the pastry. Grease a loose-bottomed tart tin (I used an 8″ tin) and preheat the oven at 180 degrees C. Roll out the pastry a little bigger than the tin. Place the pastry on the tin and gently press into the bottom corners in the inner side of the tin. With the help of a rolling pin, cut off the extra overhanging dough by rolling the pin over the edges of the tin. Prick the pastry with a fork. Add the cinnamon powder and the flour to the fruit and place the sliced fruit pieces in the tin till the last empty space is covered with fruit. The flour will absorb the juices from the fruit and prevent the pastry from being soggy. Take out the other portion of pastry from the fridge and roll out. Place it on the top of the tin. Remove any overhanging extra dough and crimp the edges. Beat an egg and brush the pie with it before you bake in the oven for about 25 to 30 minutes. If the top portion of the pie turns brown sooner than the stipulated time, you can place an aluminium foil on top and continue to bake till the golden colour is uniform on all sides. Remove from the oven. Let it cool down to room temperature. Dust the pie with some icing sugar, cut into wedges and serve. We had two wedges of the pie and loved the taste! It was just the way I like my pies…just a hint of sugar and a lovely taste of the organic, and home-grown fruits. Waiting for the next harvest….. Thank you for stopping by today. Blending Flavours is on Facebook. Would love to have you visit and Like my page!